I'm featuring 1988 Topps Cards featuring members of my beloved Blue Jays that are featured on this blog. 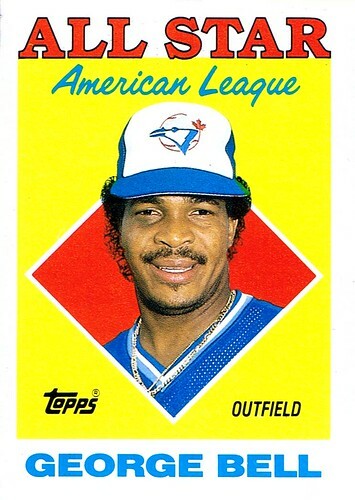 Of course George Bell was an all-star back in 1987. That was his MVP season, which he finished with a .308 BA, .352 OBP, .608 SLG, 111 R, 47 HR and 134 RBI. Damn right George Bell was an all-star, punk. Great player. In fact, behind Trammell, he was the best player in the American League in 1987.